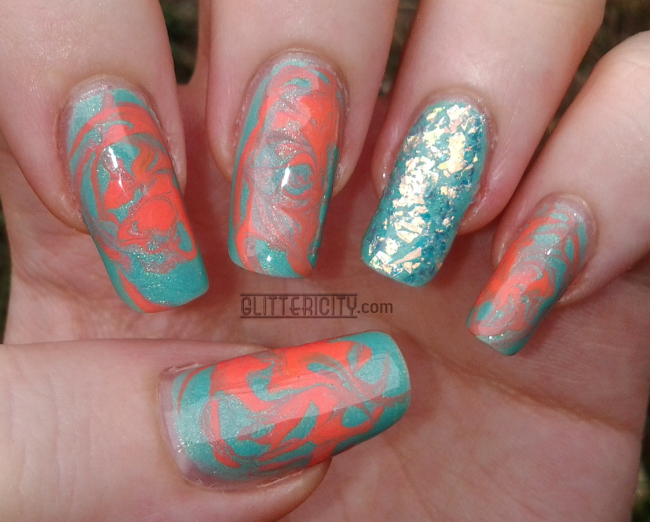 Here is a pretty mint-and-coral swirled design with a luxurious accent nail! The base for all nails is the gorgeous Sinful Colors Mint Apple. A creamy mint polish with lovely shimmer and a wonderful formula, it's one I recommend any day of the week. After the first coat was dry, I set to work on the accent nail! 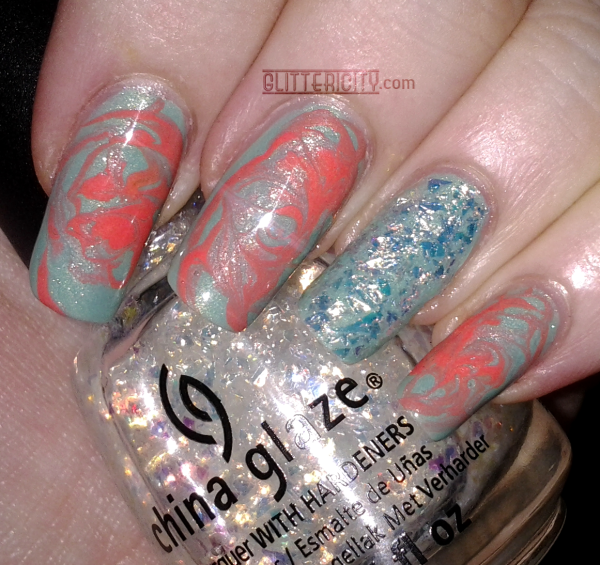 I used the flakie polish shown above--China Glaze Luxe And Lush (hence the title of this post). Big chunky iridescent pieces in a clear base--it's awesome! I painted two coats, and then used an orange stick to pick out individual pieces to fill in the gaps, as I wanted the entire nail to be fully covered in opalescent flakes. For the rest of the nails, I placed a few small drops of Mint Apple as well as a drop or two of Sally Hansen Insta-Dri Snappy Sorbet--a orangey-coral creme that picks up the peachy tone in the flakies really well. (They photographed more pink than peach, but they're closer in colour-family in real life.) I used a small striping brush to swirl these drops together gently to create a marbled look without having to do water-marbling. Learned this technique from Robin Moses! It's all topcoated first with Maya's Smoothing Coat for Glitter, and then Seche Vite on top for quick-drying shine. I need to use this marbling technique more often! 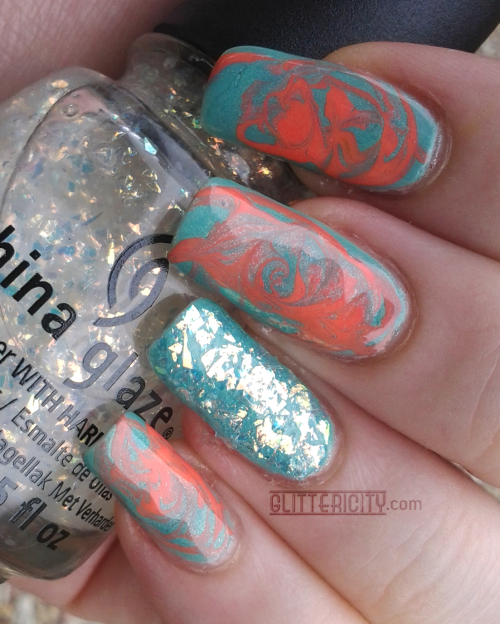 I actually quite enjoy water-marbling, but this is much easier and less messy. I also think I need to do an entire manicure of flakie mint nails like that--how pretty did those come out? !